Holy Toledo, Batman! 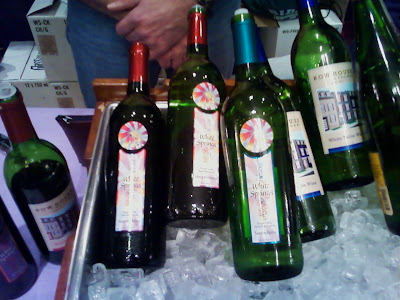 I missed the Lehigh Valley Nouveau Wine Weekend! The nine family-owned wineries of the Lehigh Valley Wine Trail proudly introduced their first vintages from this fall’s harvest during the annual Nouveau Weekend event on Saturday, Nov. 15 and 16. "Nouveau" is the French word for "new" and in wine making it applies to a specific style of wine produced just weeks after harvest. Nouveau typically is a red wine that goes through a rapid fermentation. This style of winemaking produces an aromatic, fruity, soft wine with vivid colors that are delicious and ready to drink shortly after harvest. These Nouveau wines can age for several years, however they are meant to be drank while young and at the height of flavor. 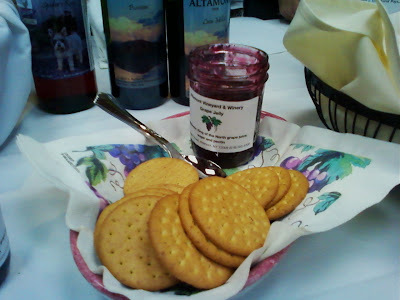 • Amoré Vineyards & Winery, Nazareth – featured new releases of Chambourcin Reserve, Cabernet Sauvignon, and Chardonnay along with Goot Essa cheeses. • Big Creek Vineyard and Winery, Kresgeville – turned back the clock, releasing a traditional style of Nouveau, made with Gamay Beaujolais, along with a seasonal spiced apple wine for the holidays. 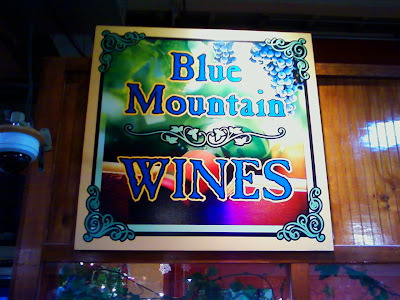 • Blue Mountain Vineyards & Cellars, LTD., New Tripoli – paired their 2008 Nouveau with cranberry glazed chicken. Also their Mountain Spice wine was heated and served with pumpkin spice cake. • Sorrenti Cherry Valley Vineyards, Saylorsburg - paired "Mary's Marinated Mushrooms” with DeChaunac Wine. 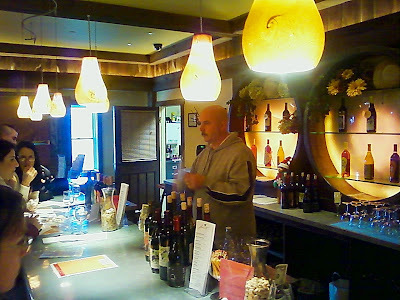 • Clover Hill Vineyards & Winery, Breinigsville – featured the new release of Turtle Rock Red. 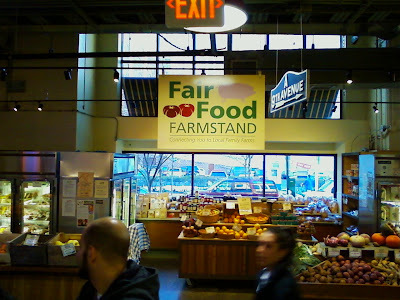 They were joined by Breakaway Farms of Manheim, Pa. who sampled and sold their 100 percent organic and chemical free cheeses and meats. • Franklin Hills Vineyards, Bangor – paired their wine with a delicious sampling of roast turkey, stuffing and homemade cranberry sauce. • Galen Glen Vineyard & Winery, Andreas – warmed up with Chambourcin mulled wine tasted with Vinkaka (wine cake) made using our Barrel 29, a Chambourcin port-style dessert wine. • Pinnacle Ridge, Kutztown –sampled a taste of Austria. Their NuVo follows the Austrian tradition of Heuriger wines. This freshly fermented white wine of the new harvest is offered in the taverns surrounding Vienna. They will be pairing the winery’s white NuVo with Austrian goulash and tiny homemade dumplings. 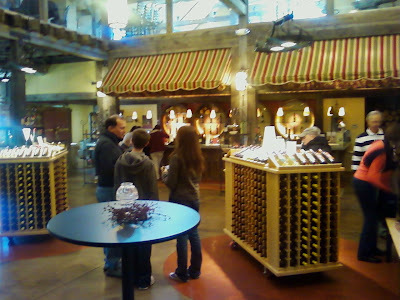 • Vynecrest Winery, Breinigsville – released its first vintage of the 2008 season, a Gamay Beaujolais Nouveau wine. They paired it with caramelized onion herb & cheese focaccia bread. What a great event. Make a New Years resolution to tatse these great wines, and make sure to mark it in your 2010 calendar (November 21 & 22) so you don't miss it next year! So for the holidays, Dom and I decided to take the boys to Camden to the New Jersey state aquarium. 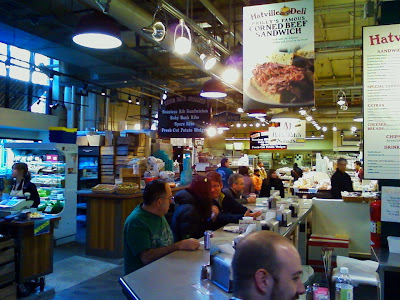 And from there we decided to go to the Reading Terminal. 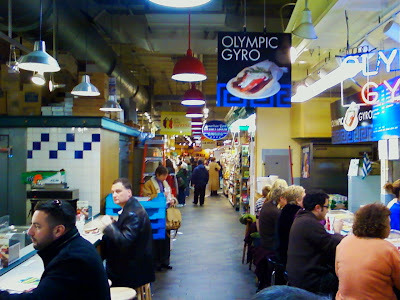 While we were there we ate Philly cheesesteaks (all three variations.....American cheese, Provalone, and Cheese Whiz). 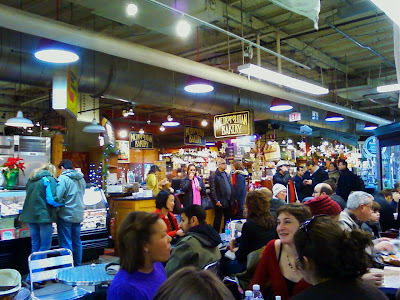 We shopped the stalls, and ate fresh baked cookies, drank organic eggnog, and sampled other locally grown and artisanal products. 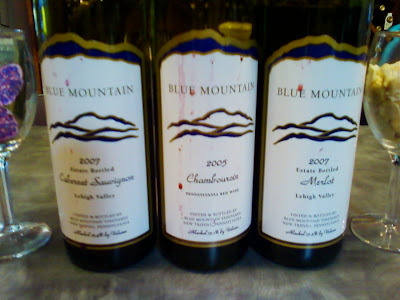 And then we went to Blue Mountain tastingroom and had some wine! 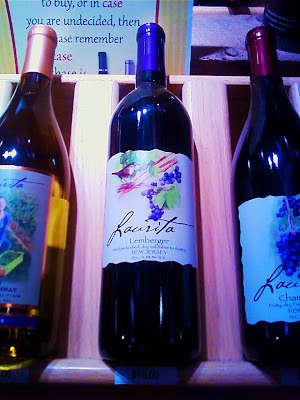 I tried the Chambourcin, the Merlot, and the Cabernet Sauvignon. The Chambourcin was very good. The Merlot was a light bodied Merlot, but tasy, with vanilla and light hints of cherry. And the Sauvignon Blanc was a medium bodied dry red wine with lots of big fruit, oak and nce acidity. Good job! And of course I got the last bottle of nouveau! 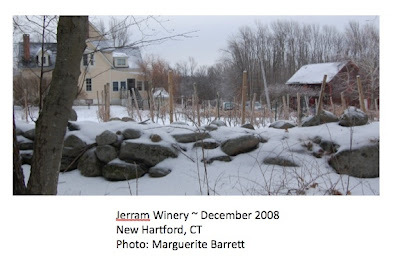 Jerram Vineyards is located on Hill Town Road in New Hartford, Connecticut. They opened their doors in 1998. James Jerram runs the vineyards and winery with his wife, who runs a gardening supply. This allows the couple to combine their favorite hobbies, and cuts their commute down to a stroll in the back yard! As James explained, “I do this because I like to do this.” It’s a labour of love, and the love shines through in the way he talks about his vines and wines. 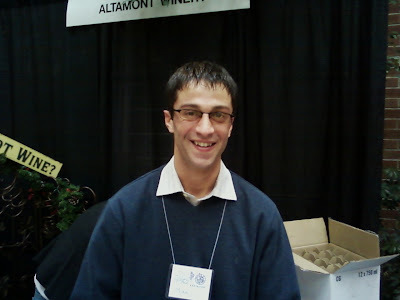 James is no newcomer to winemaking in Connecticut. 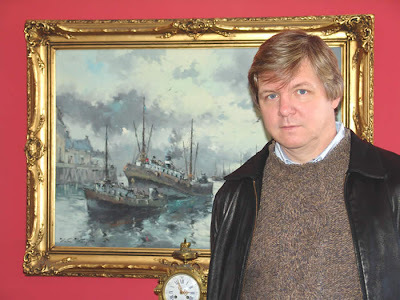 He began the winery in 1982 with a planting of Marechal Foch. Unfortunately, weather in New England is rarely cooperative. He lost 100 vines outright during a winter storm, and another 100 died the following year, giving grapes as they went. In the late ’80s he added in Seyval and Vignoles, and soon Villard de Blanc and Chambourcin followed. His love of growing goes beyond grapes – his vineyards deliberately curl around an old Bartlett Pear tree which he loves. He has even made pear wine from the fruit! One of their most popular wines is Vespers. Vespers is a late harvest Vignoles. Smooth, silky, with touches of apricot and honey, this is a classic dessert wine. Great for cheese or dessert. It's that time of year....and we're not talking the Holidays! Wineries Unlimited is not that far away. And Ricard Leahy just announced that the accomplished Mr. Andy Beckstoffer will be the keynote giver at this year's events. Somethign ver much to look forward to! See you in March at Valley Forge! Wineries Unlimited is proud to announce that Andy Beckstoffer of Beckstoffer Vineyards will be featured speaker at this year’s keynote lunch on March 10. 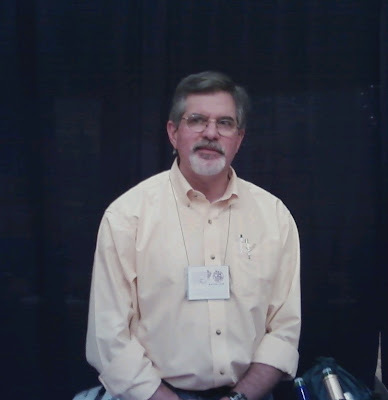 Andy is the most highly regarded independent wine-grape grower in Northern California. A native of Richmond, Virginia, Beckstoffer garnered a BS in engineering at Virginia Tech and an MBA at Dartmouth. As president of Beckstoffer Vineyards, his empire stretches through the North Coast counties of Napa, Mendocino and Lake. As a visionary, Beckstoffer was responsible for planting 500 acres of Napa Valley Cabernet Sauvignon in the early 1970s, a remarkable feat considering only 682 existed in 1969. As a 33-year-old entrepreneur, he devised a 1973 leveraged buyout of a vineyard company and 1,200 acres of land in Napa and Mendocino with an investment of only $7,500 in cash. His many accomplishments include founding the Napa Valley Grape Growers Association (NVGGA) in 1975, and introducing the modern-era practice of pricing a ton of grapes on the future bottle price (i.e. bottle price times 100 equals the cost of a ton of grapes). The NVGGA presented him with its first “Grower of the Year” award in 2006 while in 2007, the Napa County Farm Bureau named him “Agriculturist of Year” and he received the first-ever “U.S. Congressional Wine Caucus Commendation”. The keynote lunch has limited seating so early registration is strongly suggested. Beckstoffer also joins several outstanding Eastern grape growers during the panel discussion “Extreme Viticulture: What It Takes to Get Top Dollar” later that day. 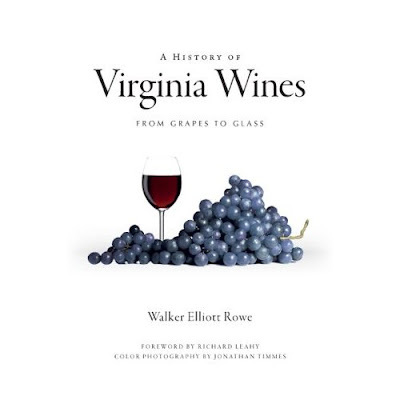 The following is a review of Walker Elliott Rowe's A History of Virginia Wines. Rowe is one of the two best experts on Virginia wines, the other being Richard Leahy, who wrote the introduction to this fine volume. 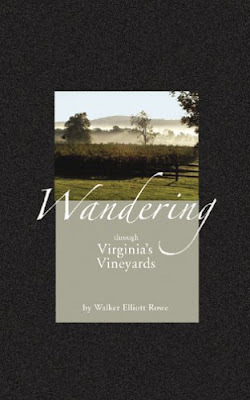 Rowe has a previous Virginia wine book to his credit, called Wandering Through Virginia's Vineyards. Rowe is a good writer and he doesn't miss a trick. Excellent stuff. Great holiday or birthday present for the local wine lover in your life. Thomas Jefferson did more than draft the Declaration of Independence. He founded the University of Virginia. He served as the country’s third president. And he ended up with his face on the nickel and the ever-rare $2 bill. At home, I keep a $2 bill inside a glass imprinted with the logo of the old Dye’s Vineyards, a winery once located in Russell County, Va.
Thomas Jefferson had much to do with promoting the early wine industry of Virginia. 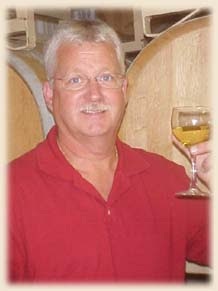 In turn, Ken Dye – the founder and former owner of Dye’s Vineyards – had much to do with launching the wine industry of Southwest Virginia: Dye first planted grapes at the foot of Big A Mountain in 1989 and later operated a winery that remained open for a decade. As for Jefferson, writes author Walker Elliott Rowe, "Any book on Virginia wines and vineyards must include an essay on Thomas Jefferson, for the former president and author of the Declaration of Independence is the most famous grape grower in Virginia." Still, Jefferson never made any wine at his famous home, Monticello, according to Rowe. But the president did spend a great portion of his civil service salary on his wine cellar, Rowe writes in the newly released “A History of Virginia Wines: From Grapes to Glass” (The History Press, $19.99). Jefferson also, as a farmer, hoped that French grapes could be grown in Virginia. So he imported a grape grower from Italy plus 30 assistants to set up a vineyard at Monticello. Rowe’s book profiles vineyards in Virginia, stepping inside the minds and vines of wineries in Williamsburg and Barboursville. He also focuses a chapter on migrant farm workers in Virginia – and their importance to maintaining vineyards. The successful industry of today can be traced to the dreams of Jefferson and the determination of ladies like Elizabeth Furness. At age 75, Furness founded Piedmont Vineyards at Middlesburg, Va., in 1973, turning her dairy farm into a vinifera grape vineyard. Furness had grown up in France, and, for inspiration, she relied simply on a memory of what she had seen as a child to organize her vineyard. Later, in 1978, to help make a claim that she was the first in Virginia to sell vinifera grape wine, Furness sold seven bottles to a wine shop in Washington, D.C.
And then? She repurchased all of that wine for her own wine cellar. The buyback did not matter. Rowe writes Furness was still recognized by the governor and the Commissioner of Agriculture – just for that agricultural feat. I am a big fan of Benmarl in the Hudson Valley. Kristop Brown and Matt Specarelli, and the entire SPecarelli family, are working wonders, taking an old line name in the Hudson Valley and turning it into one of the very forward thinking, modern wineries in the Valley. It's a special place, where special things are going on. 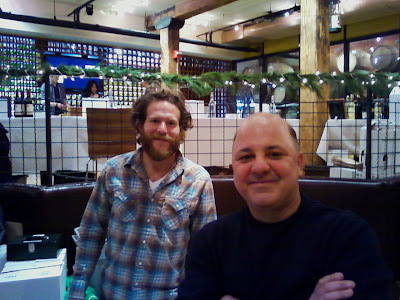 I recently saw Matt Specarelli at the City Winery event, and tried some of their wines. 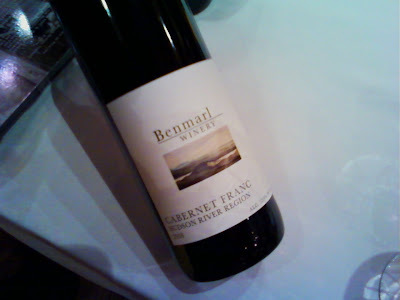 One of the nicest surprises of the day was their 2008 Cabernet Franc Hudson River Region. Really nice nose. None of the grassiness you sometimes get from a Cab Franc. This had a nice deep, purple color. Big nose. Touch of plum and vanilla. Bright and dark chaerry on the tongue. Smooth, dry, delicious finish! 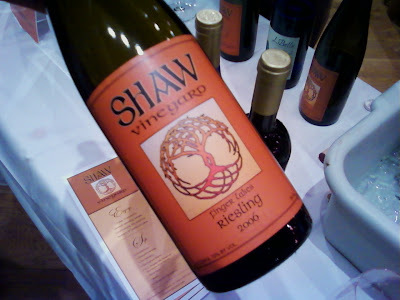 I'm a big fan of Shaw Vineyard in the Finger Lakes. 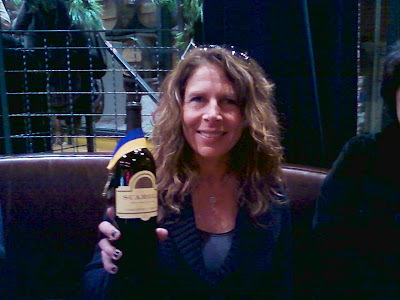 And at the recent City Winery event, I had the lucky chance to try the 2006 Riesling. Their 2005 Dry Riesling scored an 88 from Wine Spectator. So you know they know what they're doing when it comes to Riesling. The 2006 Riesling was delicious! Light, crisp, lots of green apple. Hint of sweetness. Excellent! 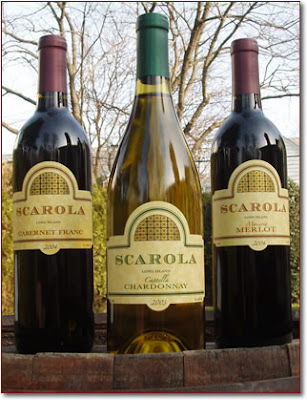 Scarola Vineyards is a small Long Island wine producer dedicated to honoring and sustaining a family tradition begun generations ago in Bari, Italy, a port city on the Adriatic Sea where Frank Scarola's ancestors toiled as farmers and winemakers. In 1947, Frank's father came from Bari to the United States. Over sixty years later, inspired by his family's traditions, Frank is fulfilling his dream of producing delicious wines from grapes grown on the beautiful North Fork of Long Island, a European-style growing region blessed with microclimates and soils ideal for winegrowing. Frank's wines are handcrafted. Scarola makes only 500 cases a year. And for every job at the winery, there is a Scarola manning the position. It is a family affair. Roman Roth is the consultant winemaker, who works with Frank to make the wines. I'm a huge fan of Roman's, as are many people. Their Merlot is special. The 2005 'Masseria' Merlot has been a huge critical success. Look at the awards. This is a nice deep wine with dark color, and big, beautiful nose. 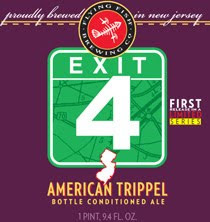 Aromas and flavors of bright black cherry, blackberry and plum come through as promised. A wonderful find and definitely worth searching out! Congrats to all the Scarolas!!!!! Now, generally speaking, I like bright, brisk, clear, crisp chardonnays, more like Sauvingnon Blancs than near the buttery sur lees types. Give minerals. Give me rocks! But I make a few exceptions...and one of them is Sherwood House Chardonnay. I have Sherwood House to my most finicky Francofile friends, who turn up their noses at US chardonnays. 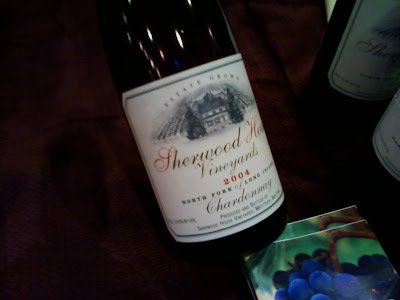 And I have not yet had one who wasn't completely taken aback and wholly surprised by the wonderful delicacy of Sherwood House's Chardonnay. AT City Winery I thought I'd go see if I liked their chardonnay as much as I used to. And there was no question of it. It's lightly oaked, and smooth and tastey. There's still lots of fresh fruit, nice balance. I pined for food to go with it. But it was lovely in-and-of-itself! Established in l996, Sherwood House Vineyards has been committed to the production of world class wines using only estate-grown vinifera grapes. Owners Dr. Charles Smithen and wife Barbara believe that producing fine wine is a combination of passion and patience, handcrafting their wines using traditional methods combined with the latest scientific techniques. "There's very little nature and man can do in true harmony," says Dr. Smithen. "A vineyard is one of those things. Making wine requires both science and art to excel. Anyone can learn the science. But it's the art, the near-intuitive understanding, the smell, sense, and feel, that makes the difference." There is a difference indeed. Onabay Vineyards is among the East End’s newer wine producers. It rose on family farmland; 19 acres are planted with wine grapes, primarily , and . The vines date to 1991. Onabay specializes in and still wines, and also produces sparkling wines. The 2006 Night Heron ($25) is fruity, with a hint of herbs; the 2006 Blanc de Blancs Brut ($36) sparkling wine, citrusy and refreshing, made with . Onabay has no winery. 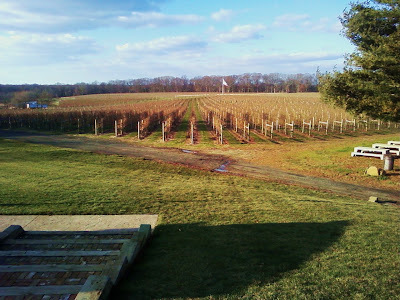 The wines are made at Premium Wine Group in Mattituck, like many other wonderful wines in Long Island. The Anderson family is committed to the artisanal wines of Onabay Vineyards. Proud of their stewardship of the land, they appreciate the extraordinary natural beauty and bounty of the North Fork, and its culture of great wine, cuisine, and people. Brad Anderson is committed to producing high quality vintages with the help of Bruce Schneider, international wine consultant, and Steve Mudd, veteran North Fork viticulturist. Francesca Anderson is a renowned botanical artist. Her drawings of herons appear on the front labels. Daughter, Mia C. Anderson's poems also grace the labels. She is a published poet of natural history themes and the environment. Chiara Anderson Edmands oversees the marketing of Onabay Vineyards. 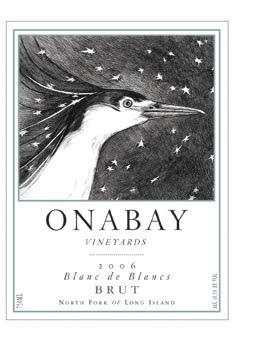 She and her husband, Ben, delight in pairing wine with the delicious bounty of the North Fork. 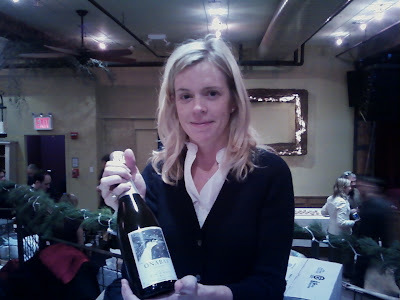 I met Chiara at the City Winery event Uncork New York, where she was friendly and chatty, and decided to taste the Blanc de Blancs Brut 2006. The Andersons were inspired by the Blanc de Blancs Champagnes of the Cote des Blancs region. The wine is 100% Chardonnay. The wine is made by the traditional method, with a second fermentation taking place in the bottle. It benefits from contact with the lees that allow the acidity of the wine to soften just enough to achieve an elegant balance. The very modest level of sugar in the dosage that is added back during disgorgement ensures that the wine remains crisp and refreshing on the palate. As promised, the aromas of green apples, lemon verbena, and honey blossoms come through. On the palate, pear and apple fills the mouth. The wine is crisp and refreshing. It has a touch of citrus on the end. This was a lovely bubbly. Really very nice. And one likes the sense of family involved in Onabay. A lovely product, just right for the holidays, Valentine's day, or any day! A great wine for special occasions....or a night you want to make a special occasion. Great job, Andersons! Raphael is one of the first growths of the east coast. There is no question they are among the highest choir of angels in the wine firmament on the eastern seaboard. 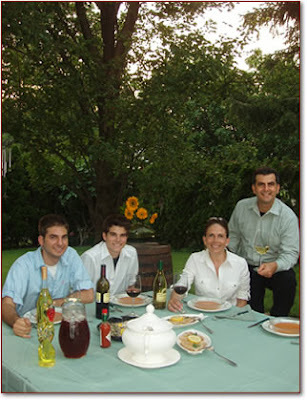 They have been praised by Wine Spectator and lauded by the New York Times. Now, Raphael has come out with a lovely new table wine called La Tavola. It's only $12.95 and marks Raphael's entry into the more easilly affordable red wine market with a medium bodied red that great for food and entertaining. 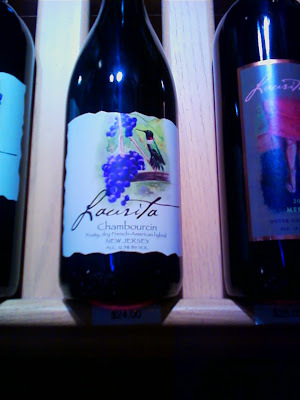 A lovely, everyday kind of wine priced very affordably for the averge consumer. The 2007 vintage was one of the finest ever experienced on the North Fork. Hot sunny days and with clear blue skies seemed to be the norm for most days. Low levels of rainfall and humidity throughout the season made for almost perfect growing conditions. The high levels of solar radiation along with cooler weather in the late summer and fall allowed for great concentration of flavor, color and extract along with wonderful retention of aromatics in the fruit. 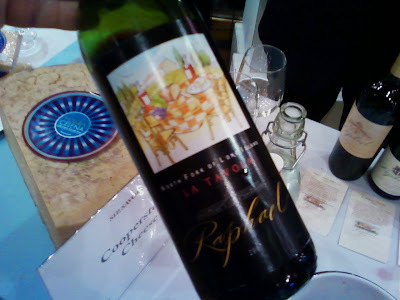 Great, handcrafted wine at a great price marks the debut of Raphael’s 2007 La Tavola. Meaning “The Table” in Italian, this wine was made for everyday enjoyment and is a regular feature on our mealtime table. The wine is made from mostly younger vines and reflects a blend of the three of the most important red wine varieties on the North Fork. La Tavola is fruity and soft, and retains classic elegance reflecting the extreme ripeness of the vintage. The Merlot provides velvety ripe tannins and dense mouth feel while the Malbec adds an exotic and earthy touch. The Cabernet Franc rounds out the blend with its typical saline minerality and firm acidity which lifts the flavors, adding to a pleasant long finish. This wine outclasses most wines in its price category and is one of the North Fork’s great wine values from an outstanding vintage. I rarely look at the tasting notes before I drink a wine. I don;t want to be lead. I want to taste what I find. However, the notes are acurrate, and that's why I reprinted them here. This is a lovely table wine. This is the kind of wine you buy a case of at the holidays and impress your friends with all the way through. 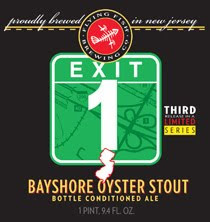 And then buy another case in January and savor through the winter. Fabulous wine. Fabulous price. Fabulous winery. Raphael once again proves why it is one of the premiere wineries on the east coast! Winemaker Derek Wilbur of White Spring Estate Winery. Derek is easilly one of my favorite winemakers in the Finger Lakes. I especially like his whites. One I had never tried before was yet another fun new wine. A real crowd pleaser. Serendipity is a wonderful wine. Great acidity balances the flavor and the sweetess. A really, really nice wine. 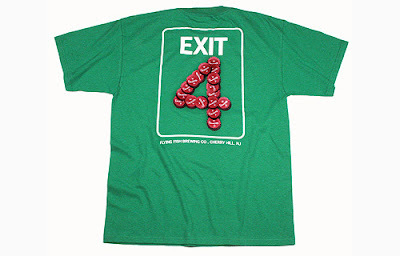 Great for the holidays, be it Thanksgiving, Christmas, or Fourth of July! At the Harvest Festival 2009 in Albany, NY. I met Mike DiCrecenzo of Altamont Vienyard. I tried their Leon Millot. It was a very nice, medium bodied red. A very nice red table wine and a new winery in the Northern Hudson Valley. A nice new find! 12 miles east of Albany! Here's an interview they did which I've reprinted here. They also make jams from the fruits they grow on the farm. We are located at 3001 Furbeck Road, Altamont, NY 12009. Take Settles Hill Road to Furbeck Road. 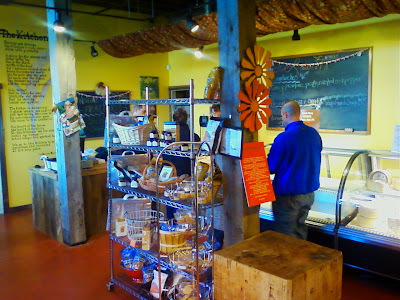 Approximately 12 miles west from the end of I-87 on route 20, We are very close to Altamont Orchards. 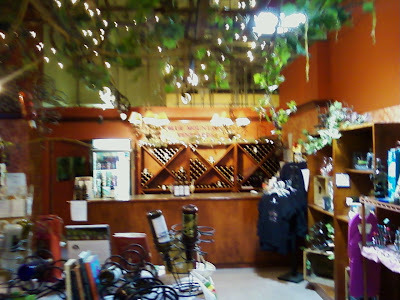 We started reestablishing the vineyard and remodeling the winery in December of 2006. The vineyard had seen better days but we had faith that the vines were still fruitful and the location was one of a kind. 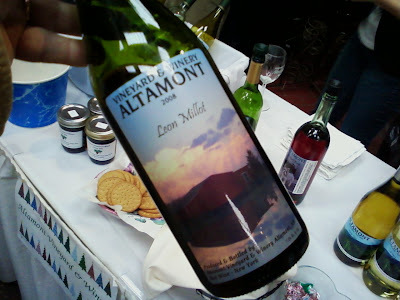 In 2008, we formed Altamont Vineyard and Winery, focusing on the local supply of grapes and wines. Since that time, we have produced approximately 30 tons of grapes and roughly 1200 cases of wine to be sold. We are very lucky to be able to represent the local community and Albany County as it’s first and only vineyard and winery. We have found our neighbors appreciate seeing the vineyard being managed after many years sitting unattended. What kind of wines do you sell? We produce and bottle wines made from hybrid grapes grown on the premises. The grapes planted have been developed to sustain the cold-harsh winters and wet-humid summers. Vines were planted starting in 1981 to 1996 as experiments by Larry Grossi, who opened Larry’s Vineyard and Farm Winery in 1988. We have a white wine resembling a Riesling called Edelweiss, which Larry also made and is still very popular, and St. Pepin, a cold-hearty grape variety developed at the University of Minnesota by Elmer Swenson. We also have a Cabernet-style red called Passione, a blend of DeChaunac and St. Croix; a Burgundy-style red called Leon Millot; two sweet wines, Elefante and Spider’s Rose; two types of Cayuga White one of which is oak aged and Patience, a blend of white wine grapes featuring citrus and herbaceous tones. Are all the wines made from grapes grown at your vineyard? This year all our wines are made from grapes grown in our vineyard. We are currently working with Wagner Farms, a vineyard in Seneca Lake, to create more varieties for next year. We are in the process of making Pinot Noir, Cabernet Franc, Gewurztraminer, Chardonnay and Riesling. We have the red grapes hand-picked and white grapes mechanically picked, crushed and pressed for the highest quality. 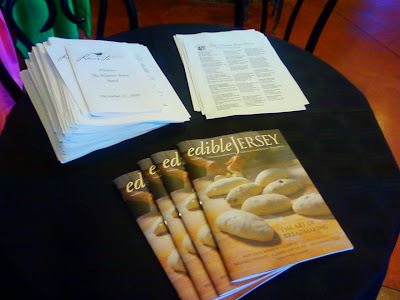 Do you offer tastings and tours? We offer free tastings Friday, Saturday, and Sunday noon to 5 pm or by appointment. Vineyard tours will start in May and winery tours are available by appointment. The store is open Friday through Sunday noon to 5 p.m.
We are at the mercy of Mother Nature, which is a huge challenge, especially as we try to reestablish a decades old vineyard to the health it should be. There are 23 different grape varieties in our vineyard, which all require a different kind of care. We’re a small operation with a limited budget. There are only three of us, so we all work long hours and depend on our friends and family, especially during harvest season. What makes you keep at it? Love of the land and it’s challenges. Living so close to nature and watching the vines grow each year makes it very rewarding. And to taste the wines evolve over the winter is quite fulfilling. Looking forward to see the reaction when patrons taste wines grown, produced, and bottled in their hometown. We invite you to taste our passion and visit before the holidays. Wine makes a great gift and being locally produced adds to the flavor. OK, so I have to admit, that I do not spend a lot of time reviewing wines from the Niagara or Erie regions. It's hard. It's on the other side of the state, and I rarely get out there...once in the last 20 years...so it's hard. I might find the wines at a wine festival every once in a while. But that's about it. 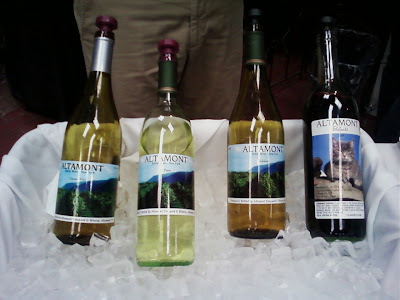 So I was thrilled that I found The Winery at Marjim Manor at the City Winery event, where I tasted their wines. Margo Sue Bittner owns the winery. The winery is an old, 9,500 square foot mansion, which at one time served as a convent. 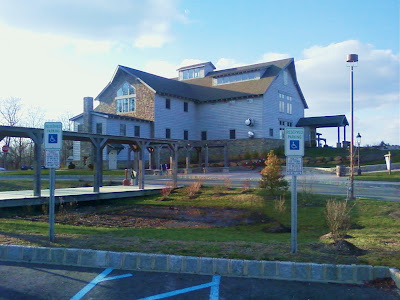 Today is large catering hall and winery, complete with rentable rooms for ceremonies, dinner parties, and weddings. It even has ghosts! 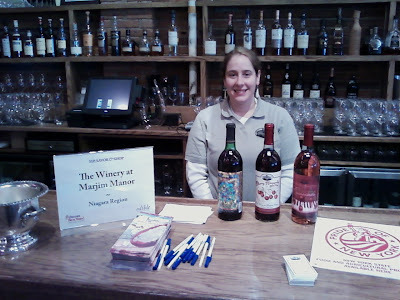 The Winery at Marjim manor is located in Western New York's fruit belt. This W.O.W. 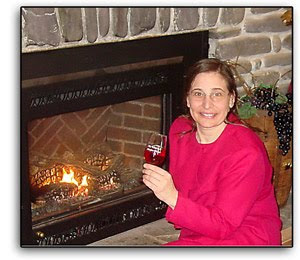 (Woman Owned Winery) is owned by Margo Sue Bittner. The Marjim name comes from a blending of her first name with that of her husband, Jim. It is a name they created 25 years ago when they began dairy farming. The Winery is a truly a family affair: Margo Bittner is president; the winemaker is her son, Kevin Bittner; her daughter, Janet Bittner assists with sales and marketing; and the fruit comes from Singer Farms, located about a quarter mile down the road where Margo’s husband Jim, is a partner. Cranberry Crescendo - a cranberry confection. It was sweet without being overbearing. The cranberry flavor definitely comes through. A nice wine! Legacy - was one of the talks of the show!!!!! It's a dry currant wine. It has a big sour taste because it made from 100% currants. 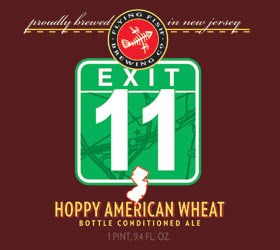 12% alcohol. And a huge, huge currant flavor! Something very different. I would personally serve it with almost anything grilled...or conversely, with chocolate desserts, which it would compliment beautifully. But no mistaking, this is a dry wine. Fascinating. 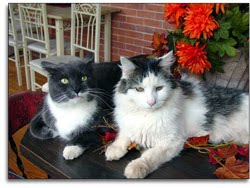 This is Shoe and Roy the winery cats. Get on over to Marjim Manor. And try their more than dozen-and-a-half wines!